The first video I saw of David Charrier was the video below. He and his cousin Sylvain Paslier play a beautiful Hang duo. In 2010 the video to the right was posted showing David talk through some of his compositions and how he puts songs together. At some point he says "don't be afraid to be boring. Being boring is OK if there is a purpose." That idea has always stuck with me. Start the composition simple and slowly add layers of complexity. I finally met David in 2014 at HangoutUK and was pleased to not only meet a great player but also make a new friend. "As a multi-instrumentalist, I’m passionate about a variety of rhythms and melodies. In 2004, I discovered the handpan, a unique "sound sculpture" with enchanting tones. My passion for the study of this instrument and my desire to create have allowed me to share my music throughout the world. Whether as a solo artist, as a duo, or with a bigger group, I’ve always loved sharing my own creations and helping people discover this instrument. 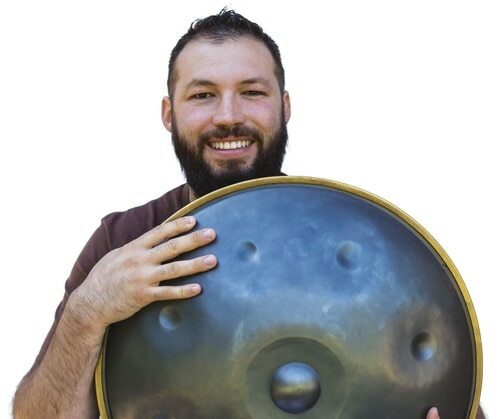 Over the past few years, I’ve really wanted to teach the handpan to others. I often travel to other countries in order to give “masterclasses” and individual courses. I love seeing players enjoy the handpan and its infinite possibilities, and I love watching my students blossom in their musical journey. In order to continue to encourage and train as many handpan enthusiasts as possible and see its magic impact lives, in 2016, I created an online handpan school called MasterTheHandpan.com, and It’s mission is « Learn fast, have fun! »"